Michael: We'll base the pattern on a common D and G chord. 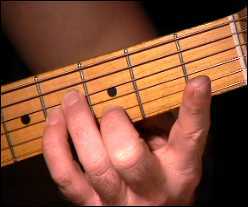 For this pattern you pick the open D string and then strum the higher strings of the chord and then play the open G on the 6th string (E) and strum the rest of the chord. Now we can add other descending chords and bass lines. Michael: Notice how the lower notes descend, they follow the D major scale. Here's the scale pattern. Michael: I actually started this pattern on the E, this would be the E Dorian mode. They all have RELATIVE notes to the D Major, here's the descending notes. 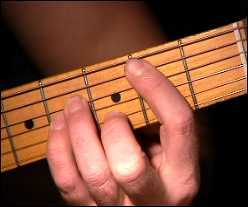 Michael: The trick is holding the chords and then picking the notes that descend. Here's our next pattern. Michael: This next pattern moves to B minor and uses the same technique. This line also ascends the pattern as well, here's some of the fingerings. Michael: Do any of you know what all the main related chords would be for D Major? mic: maj, min, min, maj, min, min? Michael: Yes mic! D Major = D, E, F#, G, A, B, C#... I.E. D Maj, E min, F#m, G Maj, A Maj, B min, C# dim, here's the chord and each related descending scale. Michael: That's it for D, here's E.
Michael: Do you see how this works? This can help you figure out songs that use this technique, now G.
Michael: Now you can also play these chords based on the 4th and 3rd strings as well. 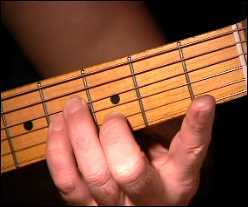 Here's an example of G, the last pattern but using the 4th string. Michael: See how all this stuff fits together? 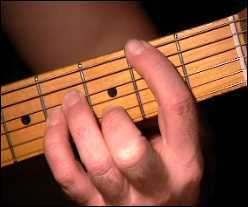 It's all based on the theory, you find the KEY, the RELATED SCALE, the main CHORD, then you adjust by either picking or strumming the progression, that's one of the main foundations to playing, writing, or figuring out how to play songs, get this and you'll be able to figure our MANY songs on your own. Let's move on, now I talked a little about "Polytonal Chords" do any of you know what this term means? Michael: Polytonal is basically playing chords that are related to a KEY, in this case D, all these chord share the D note and ascend and descend using the D note as a drone, here's an example. 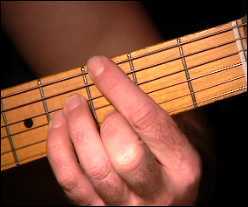 This also works on the higher strings using common D Maj and D min chord positions, only move them up the neck. Michael: Here's the basic layout, you can let the open D string note ring open for all these chords. Michael: Here's the fingerings, see how easy that is? Michael: Yes, here's another example. Michael: This time you can alter the chords. OK class, I hope this helps you in understanding some of the basics for folk and other styles of music, see you next lesson!